The Virginia House of Delegates is one of two parts in the Virginia General Assembly, the other being the Senate of Virginia. The House of Delegates has 100 members elected for terms of two years; unlike most states, these elections take place during odd-numbered years. The House is presided over by the Speaker of the House, who is elected from among the House membership by the Delegates. The Speaker is usually a member of the majority party and, as Speaker, becomes the most powerful member of the House. Starting point for this post is its Wikipedia Entry. The House shares legislative power with the Senate of Virginia, the upper house of the Virginia General Assembly. The House of Delegates is the modern-day successor to the Virginia House of Burgesses, which first met at Jamestown in 1619. The House is divided into Democratic and Republican caucuses. In addition to the Speaker, there is a majority leader, majority caucus chair, minority leader, minority caucus chair, and the chairs of the several committees of the House. The House of Burgesses was the first elected legislative body in the New World. Originally having 22 members, the House of Burgesses met from 1619 through 1632 in the choir of the church at Jamestown. From 1632 to 1699 the legislative body met at four different state houses in Jamestown. The first state house convened at the home of Colonial Governor Sir John Harvey from 1632 to 1656. The burgesses convened at the second state house from 1656 until it was destroyed in 1660. Historians have yet to precisely identify its location. The House has met in Virginia’s Capitol Building, designed by Thomas Jefferson, since 1788. The legislative body met from 1788 to 1904 in what is known as today the Old Hall of the House of Delegates or commonly referred to as the Old House Chamber. The Old House Chamber is part of the original Capitol building structure. It measures 76 feet in width and is filled today with furnishings that resemble what the room would have looked like during its time of use. There are many bronze and marble busts of historic Virginians on display in the Old House Chamber, including: George Mason, George Wythe, Patrick Henry, Richard Henry Lee, and Meriwether Lewis. From 1904 to 1906, University of Virginia graduate and architect John K. Peeples designed and built compatible classical wings to the west and east side of the Capitol building. 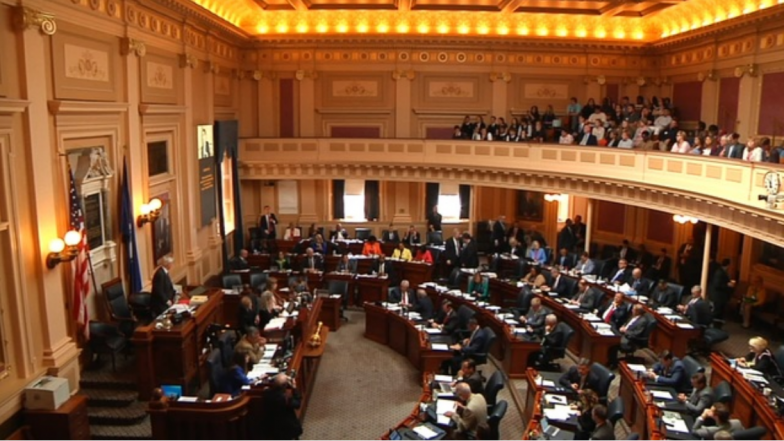 The new wings added to provide more space and serve as the legislative chambers in the Virginia General Assembly, the Senate of Virginia resides in the west chamber and the House of Delegates resides in the east chamber. The General Assembly members and staff operate from offices in the General Assembly Building, located in Capitol Square. Prior to 1788 the House of Delegates met in the Colonial Capital of Williamsburg. In 1999, Republicans took control of the House of Delegates for the first time since Reconstruction (with the exception of a brief 2-year period in which the Readjuster Party was in the majority in the 1880s). The Republican Party has held the majority in the House since then. My name is Zach Villegas. I am the lead curator for this Virginia House of Delegates post. If you have any content you would like to add to this post, submit it to me at villegaszs@mymail.vcu.edu.